Stanley Truck argues the case that the three-legged dog should have been put down. 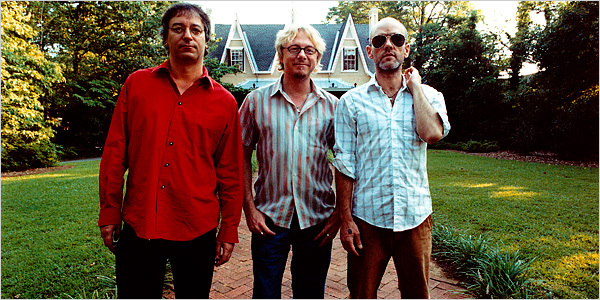 When drummer Bill Berry left REM in 1997, Michael Stipe reassured tearful fans that, Ã¢ÂÂa three-legged dog is still a dog,Ã¢Â? and so would soldier on. But a decade on it seems it would have been better taken out back, pistol in hand. The Rapid Eye Mongrel has been struggling to find its feet ever since Berry hit the hayfields Ã¢ÂÂ what with the wilful experimentalism of Up, the slick classic REM sounds of Reveal and the headless chicken that is Around the Sun. ItÃ¢ÂÂs been a long, slow decline. That their new studio album Accelerate (read Ã¢ÂÂspontaneousÃ¢ÂÂ, Ã¢ÂÂrockÃ¢ÂÂ and Ã¢ÂÂpoliticalÃ¢ÂÂ) is being hailed as a comeback is a troubling sign that theyÃ¢ÂÂve already passed the point of no return and become an Ã¢ÂÂoldiesÃ¢ÂÂ band. A cockeyed hobbling dog is indeed still a dog, but a sad and sorry one, and kingly REM deserved a dignified passing back in 1997 (the ghostly but exultant New Adventures closer Electrolite would have made a grand exit). Unfortunately they limped on and, despite shards of brilliance, theyÃ¢ÂÂve been chipping away at their reputation as alternative rock gods ever since. REM were once the definitive Ã¢ÂÂbandÃ¢ÂÂ – a bandÃ¢ÂÂs band, a four-headed monster, democratic in songwriting, playing and business, and electric in inter-band chemistry. You got the impression that they all slept in the same bed and shared the same toothbrush. Losing Berry therefore wasnÃ¢ÂÂt like losing a Tony McCarroll, a Pete Best or a Stuart Cable, it was like losing a lung. Therefore anyone who gets gooey-eyed at the memory of the time when REM. sounded like a real band, has to concede that knocking it on the head would have been the humane thing to do. As with any long-time band, there will always fans who will see light in the bleakest offerings, who will doggedly refuse to let them go, and will be clenching their fists at the nerve of the suggestion their time is long up. But even amongst the hard nuts there are those who have thought about their own dream end date for the REM bandwagon. ThereÃ¢ÂÂs the old stalwarts who believe their time should have come before the Warner sell-out of Ã¢ÂÂ88, before they started peddling bubblegum pop like Stand to the stadium hordes. ThereÃ¢ÂÂs a faction that like the idea of Up being the final curtain call, because it recalls that most famous of swansongs Let it Be in its fractured but beautiful gloom. Others wish it had been before the rumoured $80 million deal with Warner 1996, troubled by the sinister suggestions that the band didnÃ¢ÂÂt hobble on with three legs for solely artistic reasons. A handful just wished it had been anytime before the Radio Song abomination hit the airwaves. Anyway, after such blasphemy, IÃ¢ÂÂm going to be forced to eat my hat now arenÃ¢ÂÂt I, because Accelerate will be hailed as a comeback special and a Ã¢ÂÂreturn to formÃ¢ÂÂ? But then didnÃ¢ÂÂt respected rock scribe, and Getintothis hero, John Harris once declare in Q that Reveal was perhaps, Ã¢ÂÂthe most gloriously accomplished album of the groupÃ¢ÂÂs career so farÃ¢Â?? I might just have to hold on a little while longer then.